Whenever we discuss reading, we always use the words fiction and nonfiction. As we get older we talk about novels rather than fiction. The question becomes, why don’t we call novels ‘unreal books’? Teachers guide student through imagination and the story for the pleasure and keys to reading. But why not guide the students through thinking, learning and understanding? When we talk about nonfiction we really mean non-fun. People don’t usually enjoy nonfiction and see it as the burden of reading. Nonfiction always calls to mind the school curriculum and textbooks that we don’t enjoy. Children see nonfiction as a difference between childhood and adulthood. 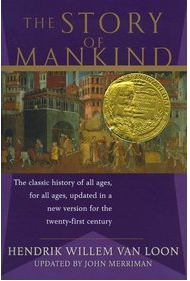 What is interesting though is that the first book to ever win the Newbery medal was “the Story of Mankind” by Hendrik Willem Van Loon in 1922. This book is actually a nonfiction book. History, at that time was a connection to the rich past that is shared as the human heritage. The assumption was that children would want to know. Knowledge was a privelege and not a chore. The thought of being a grown up was a good thing. Yet the book was written in a witty, lively manner with drawing that added personality and clarity. In 1935 A Little History of the World was published with similar assumptions to those from 1922. “All stories begin with ‘once upon a time’ and that’s just what this story is all about: what happened once upone a time.” The knowledge of nonfiction was given as a gift to the reader. As long as history followed this path, the connections were made across science, culture, life and politics. The Newbery Honors continued to go to nonfiction writing into the 1950s. Scientists, Tom Paine, Lincoln, Gandhi were all topics that were written about. History first began to introduce fiction in to the reality. The assumptions began to change and the historical fiction took the world by storm. People weren’t stressed for writing with younger readers as the audience. Math and science were not geared to children at all and the gaps grew wider. Generations were identified by their differences and common history splintered into the varried people of the world. Nonfiction now remained above the fray and is identified as “objective” and reliable”. There is no more author’s voice to add emotion and passion to the topics. Schools became guided by the textbook even more than before. There were only two exceptions to this new rule, Marx and ‘traditionalists’. This conflict still rages within the Republican National Committee. Nonfiction now is focused on the photos that are colorful, with lots of white space, short text and no real voice. This design makes it is easy to publish on the web and all around the world. Printing with lots of white space allows every language to fit between the images and explain the science behind it. Now math doesn’t exist and there is a lack of variety. This gap has allowed for fantasy to take over for young adults and the adult reading becomes nonfiction. History channel and the narrative nonfiction takes over. Math returns in statistics and allows for more nonfiction reading. This allows us to continue with the assumption of a splintered history. Every reader is assumed to not have any basic knowledge. Nonfiction is splintered into the very specific audiences. Younger children no longer look to nonfiction as pleasure. Children are going to be pressured and stressed into reading nonfiction with the common core. College students are in need of more nonfiction literacy with the need to use primary sources and reassessing the traditional narratives. The role of nonfiction is changing within the k-12 classroom. Adults are turning to the young adult fiction as their new form of reading for leisure. Reading is changing, fiction is changing, and the needs of the generations are changing. Nonfiction is changing too. For better or worse? You decide! Thank you so much! What an honor it is to be posted about on your website.